At long last, Ocracoke School Homecoming photos! Stacey O’Neal turns a love of baking into a new business. Dolphins Head to State Races! The Ocracoke Dolphins are the NC 1A East Cross Country Championships! Golden LEAF Foundation President, Dan Gerlach, is scheduled to present the Hyde County Board of Education with an award check in the amount of $200,000 on Wednesday, October 21st at 3:00 pm in the Information Highway Room at Mattamuskeet Early College High School in Swan Quarter, NC. Over 150 participants walked and ran to raise money for Ocracoke School PTA. The beautiful game comes to Ocracoke High School. 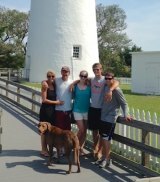 “Ocracoke is the geography of my heart,” said the island’s new 4th grade teacher, Jeanie Owens, who is scheduled to arrive today with her husband and kids. Little Ocracoke School is an outlier in the state's school grading system. Last Friday marked the last day of the school year for students.